Silky Windgrass (Apera spica-venti) is a monocot weed in the Poaceae family. In Denmark this weed first evolved multiple resistance (to 2 herbicide sites of action) in 2016 and infests Wheat. Multiple resistance has evolved to herbicides in the Groups A/1, and B/2. These particular biotypes are known to have resistance to fenoxaprop-P-ethyl, florasulam, iodosulfuron-methyl-sodium, mesosulfuron-methyl, and pinoxaden and they may be cross-resistant to other herbicides in the Groups A/1, and B/2. Greenhouse, and Laboratory trials comparing a known susceptible Silky Windgrass biotype with this Silky Windgrass biotype have been used to confirm resistance. For further information on the tests conducted please contact the local weed scientists that provided this information. There is no record of differences in fitness or competitiveness of these resistant biotypes when compared to that of normal susceptible biotypes. If you have any information pertaining to the fitness of multiple resistant Silky Windgrass from Denmark please update the database. Katerina Hamouzová, Pavlíina Košnarová, Jaroslav Salava, Josef Soukup and Pavel Hamouza. 2013. Mechanisms of resistance to acetolactate synthase-inhibiting herbicides in populations ofApera spica-ventifrom the Czech Republic. Pest Management Science : . BACKGROUND: This study investigates the mechanisms of resistance to acetolactate synthase-inhibiting herbicides in populations of Apera spica-venti (L.) P.B. from the Czech Republic. RESULTS: The proportion of resistance due to mutant acetolactate synthase (ALS) alleles was estimated by genotyping individuals from each of three populations for the eight ALS mutations known to confer resistance. Four resistance-conferring ALS mutations were identified: Pro-197-Ala, Pro-197-Thr, Trp-574-Leu and previously unreported Trp-574-Met substitution. Two populations (R1, R3) have amino acid substitution at positions Pro-197 and Trp-574. Individuals from the R3 population had two different resistance alleles. In the R2 population, only the resistant Trp-574-Met substitution was detected. Ten other single point mutations were identified, but these were not related to resistance. The cytochrome malathion decreased chlorsulfuron resistance in the resistant populations that were examined. Although malathion increased mortality, the GR50 values were too high to conclude that non-target-based mechanism was the main one for the resistance in Apera spica-venti populations tested in this study. CONCLUSIONS: Individuals of Apera spica-venti populations tested in this study possess the target-site ALS resistance mutation and an additional so far unknown resistance mechanism(s)..
Wolber, D. ; Warnecke-Busch, G. ; Wagner, J.. 2012. Herbizidresistence at Alopecurus myosuroides und Apera spica-venti in Lower Saxony. Julius-Kühn-Archiv : 443 - 445. Wagner, J. ; Wolber, D.. 2012. Occurence of herbicide resistance to ALS-inhibitors and of resistance alleles identified by pyrosequencing in Alopecurus myosuroides Huds. (blackgrass) und Apera spica-venti (L.) Beauv. (silky bent-grass) in agricultural areas from Lower Saxony. Julius-Kühn-Archiv : . Rummland, J. ; Kerlen, D. ; Nordmeyer, H. ; Richter, O.. 2012. Modelling the development of herbicide resistance. Julius-Kühn-Archiv 1 : 149 - 154. A population dynamic and genetic model was used to simulate the genetic evolution in an Apera spica-venti (L.) P. Beauv. population. The basis of the model is a life cycle of an annual weed population which is divided into five development stages. These are the seed bank, the seedlings, young plants, the seed producing plants and the produced seeds. The stages are linked through transition probabilities. The interaction between resistant and susceptible genotypes is mediated by a genetic submodel. The model supports the development of management strategies to prevent, reduce or at least retard the development of resistance. Through an embedment into a cellular automaton the dispersal of genetic information is simulated at field scale. Three simulations with different herbicide treatments are compared regarding the resistance evolution..
Petersen, J. ; Naruhn, G. ; Raffel, H.. 2012. Non target-site resistance inherent in Alopecurus myosuroides and Apera spica-venti - resistance pattern and factors. Julius-Kühn-Archiv 1 : 43 - 50. 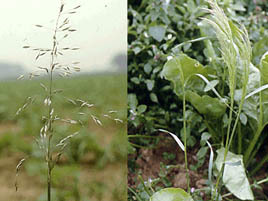 Alopecurus myosuroides and Apera spica-venti are the most important grass weeds in German cereal cropping systems. Both species show increasing resistance problems with herbicide resistant biotypes in many regions. In many cases, non target-site resistance (TSR) mechanism can be detected. In these biotypes resistance is assumingly based on non target-site-mechanisms (NTSR) and an enhanced metabolism might be responsible in the first place. Resistance in A. spica-venti biotypes can also be found against pre-emergence herbicides like diflufenican and pendimethalin. However, untill now no resistance in A. spica-venti against the active ingredients flurtamone, flufenacet and prosulfocarb could be detected. A. myosuroides biotypes also frequently show NTSR mechanisms. Resistance patterns are variable and predictions about the efficacy of one herbicide cannot be made based on the knowledge of the effects of another ingredient even within the same mode of action group. The resistance patterns of different A. myosuroides biotypes and crosses indicate a complex, polygenetic control of NTSR mechanisms..